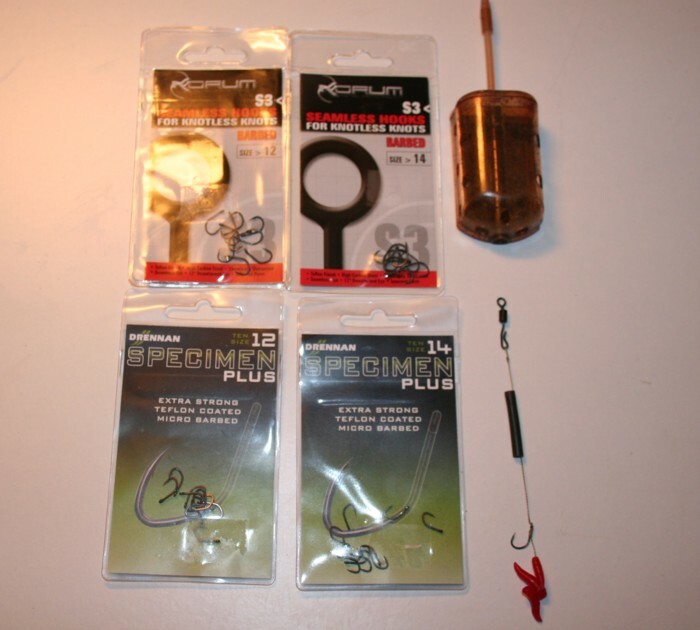 It’s time to look at some tench rigs that I’ve used in the past. I’ve used these primarily on gravel pits where the lake beds are fairly firm and perhaps are not suited to lakes with deep silty bottoms. These Drennan inline feeders have been around for a good few years and come in different sizes. I’ use these in combination with maggots. You can if required seal them up with tape to allow slower release of maggots. They have been very good for me however I used fluorocarbon(FC) as hooklinks and found that as the fish bolted then the hooklink has snapped. I’ve tried different knot’s and different FC but over the last few seasons have lost some fish. 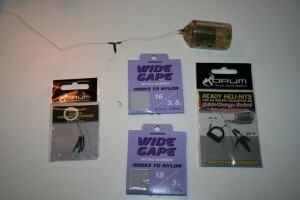 I now use braid or coated braid as the hooklink and since I’ve not had a problem. I think it’s the inertia of the fish bolting away when feeling the hook that does the damage. I fish with free spool on the reels and set at the minimum drag setting, so I don’t think there is excessive tension on the line. The setup is fairly easy with the reel line threaded through the feeder and tied to a quick change swivel. This fits fairly tight up inside the feeder and it’s this that results in producing the bolt effect. For reel line I use ESP Crystal mono line which is great for clear rivers and lakes. The hooklink here being used is Drennan 10lb fast sink braid. The knot to the hook is a knotless knot with 2 or 3 fake maggots. The other end that fits onto the quick change swivel is finished off with a figure of eight knot. To keep the hooklink on the swivel and also to prevent tangles I use some silicon tubing. 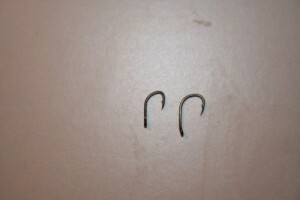 The hooklink length should be between 3 to 4 inches. The hooklinks can be tied at home and kept on a rig board ready for changing. One of the problems I’ve had in the past is keeping the rubber maggots on the hair. I used to super glue them then I would use a float stop. Simple really, just do another figure of 8 knot and thread the first maggot on then thread the line through the loop and there you have the first maggot lassoed and it’s just a case of threading on the remaining ones. As I said simple. One thing I like to do is sit at home testing the bouyancey of the hook and maggots. 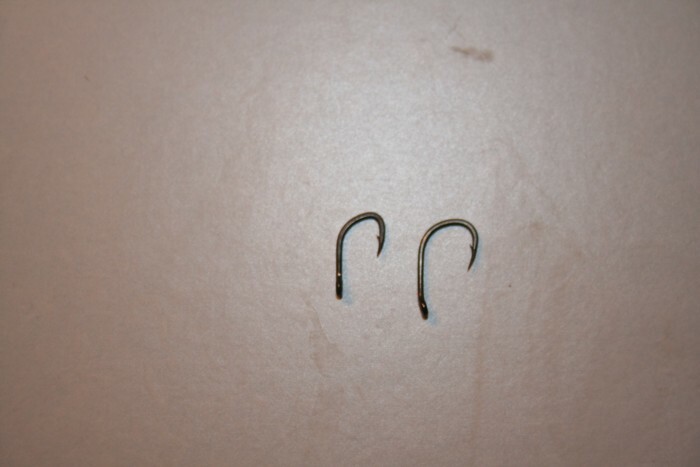 It’s very interesting when comparing different hook patterns and wire gauge. They do change significantly. Have a look at the next image to see that these are both size 14’s however the sizes are quite different and the weight required to balance the bouyancy of the hooks quite different. So when you think about hook sizes etc and think that they are the same size then please remember this image. 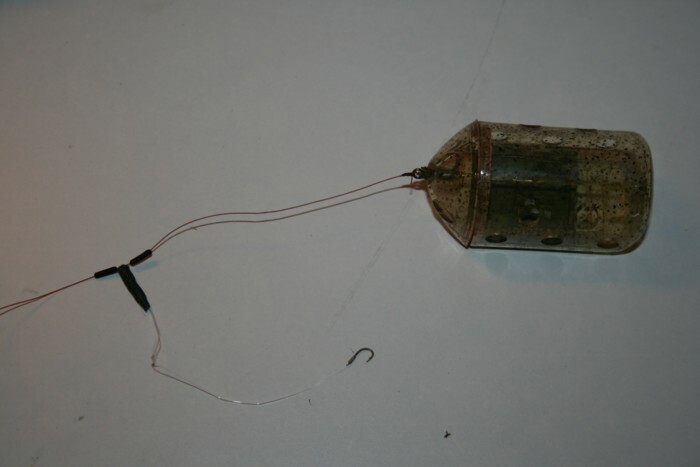 To critically balance the hook it will need a different number of rubber maggots or rig foam. So this rig is great for clear bottom conditions without too much weed. If there is some weed around then a helicopter rig may perhaps be more effective. 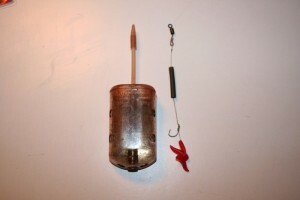 This rig enables you to change the point at which the hook sits on or just above the weed. I’ve completed a better discription of helicopter rigs on the site under articles and tips. But here is a an image or two of the setups.